I turn to you dear experts, with this question of mine. What is "typical" life expectancy of mains filter capacitors in typical household equipment? I know that the question can not be answered with any certainty, but I try to get even some coarse approximation, based ie. the minimum requirements of the standard. Also what is the coarse life expectancy with industrial equipment ie. routers or hubs. Some search tips on the subject might be nice since I don't partially know what to look for. I know the Y and X-capacitors do have some rated life expectancy figures based some transient exposure etc. but I don't know enough on the subject to make good searches on my own. As the warranty stated by the manufacturer, and should it survived longer than that, then its your gain, as simple as that. I'm not asking about warranty, I'm interested about SMPS filter (input) capacitor life expectancy what comes to the transients and how and which words and where such data might be found. I'm also interested the classification or type used in both consumer (from good to useless) and industrial (from good to wallet thickness) market. Ask the manufacturer. I haven't seen (or really looked much for) datasheets on film types giving this. I have seen one particular type which was suggestive: an EPCOS line, intended for CFL starting application. These are rated for nominal voltage (400V or whatever), but subject to large peaks (low kV) during starting, when filament resistance is low --> resonant Q, and peak V and I, are high. (Typical circuit is a half bridge driving a series resonant tank.) For this product, they gave graphs of expected value versus number of starts at such-and-such overvoltage. A similar graph would apply to any self-healing capacitor, trick is knowing the statistics of mains surges versus the damage curve for the capacitor in question. It'll vary widely with construction, so, it's up to the manufacturers to test it. There may be a little-known standard for X2 capacitors prescribing this, I don't know. Thanks. So as usual I'm interested in technical aspects that seems to be outside of known range .. Nothing unusual. I think I have also seen somewhere that sort of information.. Actually really surprising that it is not common data. I suspect my DUT have horribly disturbet mains input, comparable to something like trains.. but that is another story. What is "typical" life expectancy of mains filter capacitors in typical household equipment? Quality brands and components 10 years plus continuous. I'd expect 20-30 years would be the life expectancy with regular low usage. With that sort of equipment, quality brands I would say the between 5-10 years of continuous usage assuming no external factors before the device fails in some manner. For individual components look up the series datasheets or manufacturers testing. For X caps, unless they are old Rifa time bombs with transparent package, they usually last like forever. As of ceramic Y caps, I don't think I've seen faulty ones when used in mains filter. The cheap ones (2000hrs, 85C) can last only ~4 years assuming half to full load, in a cool room. As worst condition (slightly overload, very high or very low AC input voltage, humid and hot room), expect <2 year lifetime. My anecdotal observation is that the input bulk filter capacitor rarely fails, I have 35 year old power supplies that are still working with the original capacitors. Others have been in 24/7 service for more than 10 years and still work. This can vary widely though. Correct me if I'm wrong, but question did not sound as electrolytic smoothing cap was in question. But even if it was, they generally last much longer than you wrote. Not to say, high voltage electrolytic capacitors, especially large ones, are usually 85oC rated even if they are expensive. Typically they greatly outlast low ESR caps on secondary side. Jim Lewis, ex KEMET, told me X2 capacitors only have an expected life of a few years. Just long enough to get through EMI testing. And that happens if they are not even connected to the power line. What makes them safe makes them prone to corrosion from moisture. BigClive had a video of the foil from a failed, assume from pictures that was corrosion. For electrolytics, higher temperature devices (105C) will usually will last longer than 85C rated ones. Having said this, there are other aspects that could cause failures, namely the quality of the rubber seal. Dunno if it's true that ex Kemet employee said something like this, but what you wrote sounds more like BS. First of all, such capacitors are hermetically sealed. What I wrote about Rifa time bombs is directly related to cracks in the case and moisture getting it. However those are paper caps and they explode, not loose metalization. Most X capacitors use polymer film, not paper as insulator. Yes they are made to loose metalization if dielectric breakdown occurs. But that happens if it's a crap capacitor or because of voltage transients. It's a first time I hear about "corrosion" and loosing metalization while sitting on the shelve. I have X capacitors which are 20-30 years old and they did not loose capacitance. Do the math the exponential lifetime formula at 45 degree C.
Secondary caps fail more because they run hotter. Lifetime specs are given for max ripple current and max temperature simultaneously. Unless you have maximum ripple, such lifetime calculation is not valid. The fact is that even in such hot devices as LCD displays with CCFL backlight, 85oC mains cap rarely fails even after a decade of operation. They fail(ed) mostly because of the cap design issues and high ripple current. That was mostly problem for certain manufacturers and series, not capacitors in the whole. That problem is mostly gone away as for now. Still, I barely needed to replace mains side cap. The only things where those fail relatively often are small PSUs with small mains cap. Jim Lewis, ex KEMET, told me X2 capacitors only have an expected life of a few years. Just long enough to get through EMI testing. He is probably talking about unsoldered minimum shelf life (use by date) and that can be fixed by cleaning up the leads. Vishay are 2 years and 10 years minimum when soldered. Maximum is decades. The actual issue is related to how typical X2 Capacitors lose capacitance over time. A typical film capacitor loses capacitance, over time, because of two effects: 1) corona and 2) corrosion. The voltage applied to most X2 capacitors tends to be in the 120-277 range. Corona occurs around 300 Vac and higher. So, while some capacitance might be lost because of corona effects, this isn’t the main concern. The real concern is that moisture will eventually egress into the package and oxidize the metallization. Some plastics, like polyester, more readily absorb moisture and accelerate this effect. In typical X2 applications where the capacitor is across-the-line, the capacitance loss isn’t a concern. First, the capacitance value isn’t critical and second, most people don’t care if the end-product passes EMI tests 4-5 years into its life. When used in a series-coupling or series supply application, however, the loss can be critical. 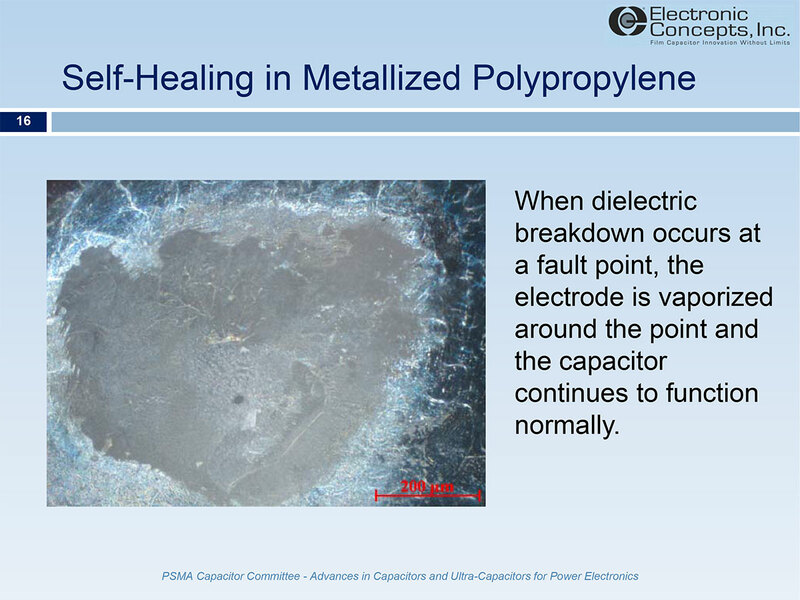 Even a 10% loss in capacitance can result in not enough current for the supply. This comes down to (and this applies across the industry), most X2s were not designed with “stable capacitance” in mind. So the R46, our most popular, can easily lose up to 30% of capacitance in a high humidity environment after only a couple of years. Which is why we made series with “better” epoxies, thicker metallization, and series-electrode constructions. Their capacitance loss will be much less than a typical X2, making them more suitable. Hermetic sealing is not used here. All resins absorb and diffuse moisture. Metal and glass seals are only used for mil spec components, and highly specialized vacuum hardware (hmm, can you get feedthru capacitors that are vacuum rated, or would you just settle for bulkhead feedthrus and tack a capacitor onto it?). X/Y safety caps that are used for line filtering aren't rated for lifetime, to my knowledge. They undergo reliability testing at a 500 or 1000 hour level per IEC standards. Actual lifetime is probably largely dependent on the line conditions which they encounter, which for a clean supply will probably be indefinite. It's interesting that nobody cares about EMI after a few years. If a product with a 10 year life cycle loses the EMI filtering after 3-4 years then there's hardly any point in worrying about it to begin with. Still, I barely needed to replace mains side cap. The only things where those fail relatively often are small PSUs with small mains cap. I actually have seen some high wattage ATX power supplies with bulged mains caps. Those PFC caps see quite some ripple. They don't just fail, they most likely will bulge and can live for quite longer after that. But to me, a bulged cap is a failed cap. As a side mote, many PC PSUs nowadays promote on silent operation, and some extreme ones (like mine) have no fans at all. My PSU runs at hot to touch temperature (and that's only the case!) 24*7, and frankly I don't know when it will blow up. When you run a fanless PSU in a shoebox ITX rig with CPU+GPU mining 24*7, things can go very wrong. But since everything else in the box are solid state (including secondary side electrolytics), and only the mains cap is wet, I bet the wet cap dies first. That is the reason for aftermarket accessories....to correct those issues like the one you described. One man's design mistake is another man's business opportunity. I'm not a game console fan (correct me if I'm wrong), but wasn't the Playstation or the XBox having a significant field failure rate because of similar reasons? There were some aftermarket cooling contraptions to correct them. Yes, but I deliberately chose this fanless PSU. I didn't anticipate the mining thing when I built this computer back in March 2016. At that time, the anticipated load will be gaming, finite element simulation and compiling, which all stress the system for a reasonable amount of time from less than a minute to 2 hours. It was never built to run 100% CPU, 100% GPU for 24/7. Yes, they suffer from similar heat induced fails, so do MacBook Pros and other computers. Some are flip chip soldering reliability issue, some are bad cap, particularly the proadlizer cap found in game consoles and Toshiba laptops. They failed mostly because of the defect in chip design, not because of lack of cooling as such. Chips were supposed to work under elevated temperature, however solder bumps under the silicon die crack because of the thermal cycling.